After sampling the pizzas and garlic bread from Sbarro, next up was Sammy Sosa. The tag line in the stall said "Chennai gets its own Mexico".I wondered how different the place would be when compared to Don Pepe. It was very different and I must say I liked the flavours. We tried the Mexi Skins and Fajitas aztec style. 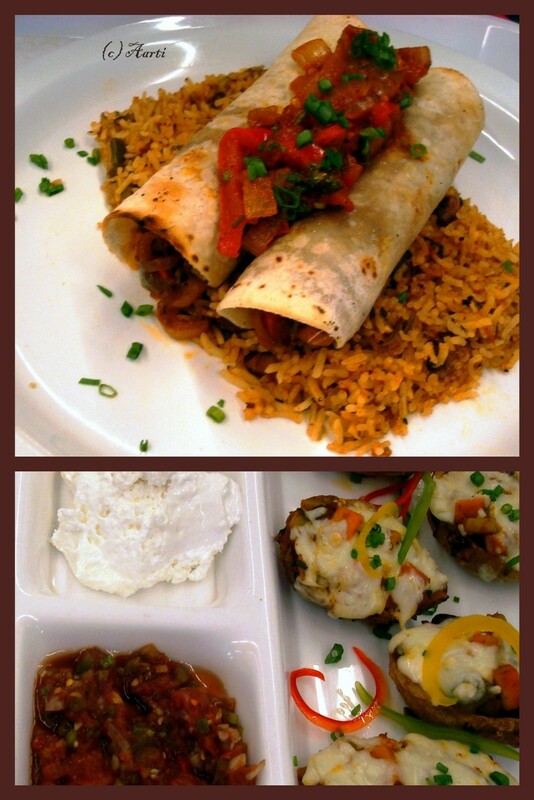 The Mexi skins were potatos with the skin on, stuffed with vegetables topped with cheese. It was served alongside curd and a salsa. We couldn't get enough of it. It was amazing, and best eaten hot. As for the Fajitas, it was served on a bed of rice that had been cooked with refried beans and had salsa on top. The fajitas were like khatti rolls, tortillas stuffed with sauted veggie filling. One plate of this and you are sure to feel full. Apart from these two dishes, the place offers quite an array of dishes, ranging from Soups, Nachos to Pizza, Virgin Margarita and chocolate desserts.